For years, Westminster College has provided a quality private college education for students from many countries. Although the majority of students attending Westminster are citizens of the United States, we enthusiastically welcome students of different cultures. Attending a college or university in the United States continues to be the goal of many international students seeking a quality education. Leaving family, friends and country to attend college in the United States requires advance planning and careful decision making. The information below is provided to help international students become acquainted with Westminster College and the steps to take when applying for admission. 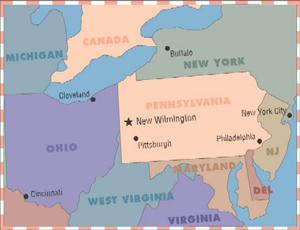 Westminster College is located in New Wilmington, Pennsylvania - a small, rural, non-industrial residential community 65 miles north of Pittsburgh, Pennsylvania, and 17 miles east of Youngstown, Ohio. The local area is made up of farms and individual residences. Westminster's 300-acre campus is a safe and serene place for students to live and study. The surrounding area offers our students many fishing, hiking, bicycling, and golfing opportunities. The climate is temperate with four seasons - snow in the winter, rain in the spring, and dry periods in summer and fall. Temperatures in vary from -29°C in the winter to +30°C in the summer, requiring appropriate clothing for each season. Westminster works on a two semester academic schedule: the fall semester runs from August to December and spring semester from January to May. Applicants are encouraged to have all their application materials in to the Admissions Office as soon as possible, but no later than May 1 for the fall semester and September 1 for the spring semester. Your academic acceptance to Westminster College will be based primarily on the strength of your secondary school work and your standardized test scores. All ORIGINAL documents (including transcripts) must be submitted for evaluation. The Application The application requires complete information regarding qualifications, English language proficiency, plan of study, financial status, letters of recommendation, and physical health of the student. It must be fully completed before the student will be considered for admission. Send two letters of recommendation; submit scores from SAT, ACT, TOEFL, or IETLTS exams, directly from the testing agency; and mail your transcripts to The Office of Admissions, Westminster College, 319 S. Market St., New Wilmington, PA 16172, email to admis@westminster.edu or fax to 724-946-6171. Financial Resources & Requirements International applicants should be prepared to meet the full cost of attendance - tuition, fees, room, board, books, supplies, and personal expenses for the calendar year - from personal or family resources or from funds supplied by their government or other outside sources. Complete the Financial Declaration for International Students, which is included in the Application. Amounts should be converted to $US dollars. The student’s record will be screened for a merit scholarship during the decision process. Students will be notified of the scholarship when he/she is accepted to Westminster College. No other financial aid will be available to international students. After you pay your deposit, the I-20 will be mailed to you. In order to apply for a student visa, you must have an I-20. Before an I-20 form can be issued, satisfactory arrangements must be made for payment of tuition and fees. Pay the I-901 fee by logging on to www.fmjfee.com. You will need proof of payment in order to apply for the visa. Register for a New Titan Day New Titan Days are our academic registration and parent/family orientation days scheduled throughout the summer. International students are not required to attend New Titan Days. Get Ready. View your packing list, room details, etc. Notify Admissions of your travel plans. Make satisfactory payment arrangements for payment of tuition and fees.